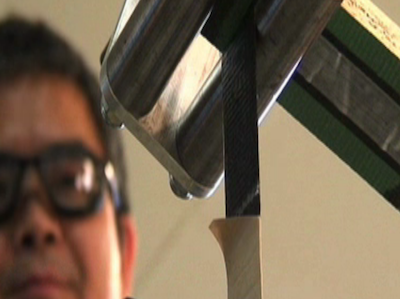 Companies do their own more sophisticated testing, like this tensile test on ZIP Tape. The company has a whole video on its testing procedures, but it's more fun to try this at home! Performance testing of adhesives and sealants used in our weather barriers is improving due to new field-testing research, as we’ve written about before. However, the improvements in testing haven’t reached a critical product area: pressure-sensitive adhesive (PSA) tapes used for sealing seams in flashing, housewrap, and generally creating continuity in air and weather barriers. “I am unaware of any work being done on this issue, either laboratory or field tests,” says Christopher White, of the National Institute of Standards and Technology (NIST).Service life of tapes can determine the service life of an entire high-performance building assembly. But none of these tests is ideally suited for lab-testing high-stretch construction flashing tapes, and none go anywhere near testing under field conditions. And since just about all tapes are used in concealed weather and air barrier systems, we really need a field-service-life prediction test. So we took matters into our own hands—or rather, our own workbench. Lately I have been just sticking a slew of tapes on different building materials and gauging how hard it is to pull them apart. My efforts got a lift in technical rigor when I was discussing this with David Gauthier, president of Vantem Panels here in Brattleboro, Vermont, a local structural insulated panel (SIP) manufacturer. David is always looking for gaskets and tapes to recommend with his panels. He said, “Hey, I bet we could use our tensile tester on the tapes!” (Van Tem uses a tensile tester to assess the strength of the bond between their skins—mostly OSB—and their foam cores). We have no illusions that the testing we performed is up to the rigor of ASTM D3330—the list of how our testing is different from the standard Test Method A is at the end of this article. "Trying this at home" at first involved some pretty unscientific conditions; trying to rip strong tape off stuff is fun but doesn't tell you much! And here is a thought: maybe our “benchtop” testing will inspire (or anger?) some experts from PSA tape manufacturers or test programs to conduct some field or field-like service life performance testing. We’d love to see more manufacturers engage in testing along the lines of the Sustainable Building Solutions Test Facility Tremco has going, in partnership with the Department of Energy.There are a lot of key differences, so no conclusions should be drawn from this testing. In any case, not all manufacturers report D3330, so we needed to pick one set of conditions and run as many tapes as we had through that one. We hope this testing provides some suggestive information. After all, if the sealant manufacturers have rallied behind the work of Dr. Christopher White at NIST on standardized testing for field service life prediction of liquid sealants, can’t the PSA tape manufacturers rally behind our humble work to develop some testing and data for the field service life of PSA tapes? Here are some things we noticed based on our test results (click to download the spreadsheet). And since MOST of the tapes we tested had very similar stretch outcomes (2:1; see column J – “Travel Ratio”), that helps our habit of comparing the test results of different tapes. The notable exception would be the DuPont FlexWrap; it yields considerably lower tensile results but its stretch ratio was 14 compared to 2! “Aging” of specimens – Ken Levenson of 475 High Performance Building Supply cautioned us that the solid acrylic adhesive used by Pro Clima tapes needs more time than other tapes to fully develop its adhesive bond—at least a couple of hours. Our results seem to support this; compare rows 17 and 31. The “aged” UNITAPE had significantly higher results. Compare Tescon VANA tape in rows 29 and 34; they “aged” results are much higher as well. Smooth vs. rough side OSB – PSA tapes just don’t stick to the rough side of OSB as well as the smooth side, period. Trouble is, some building inspectors mandate that the smooth side be to the interior (so that they can see the grade stamp—always on the smooth side—after the structural sheathing is covered with other materials, WRB and/or claddings). This puts the rough side to the exterior, right where you are likely to be taping seams for an OSB air barrier or window opening flashing if your windows are going in before your WRB. Performance comparison of different types of adhesives – we need more data on this one, but the results suggest that acrylics demonstrate stronger adhesion than modified bitumen. We can’t really say much about the only butyl rubber tape, since its far greater stretch ratio makes its peak so much lower than the other adhesive tapes. At the same time, the builder group that I worked with in the tensile testing, expressed interest in the combined performance/cost of the various tapes. The Huber ZipWall tape (solvent-based acrylic), at $20 per 75-foot roll, nearly half the cost of the Siga and Pro Clima tapes (solid acrylic) was a clear winner with the builders. This is just baseline data. The builder group was quick to point out how “unreal” this “benchtop” testing was: what about applying the tape at 5ºF, or when the substrate is damp, or after 10 years of extreme temperature cycling in the building assembly? Could be the solid acrylic tape manufacturer claims of superior performance be worth the higher cost? We hope to follow up this baseline ideal conditions testing with more field-like conditions. Be careful with tape and OSB: no tape sticks well to the rough side, so smooth-side-out is best for taping seams. [1.4] High stretch at low forces – D3330 does not handle high stretch tapes particularly well; the high stretch can lead to high variability in the test results. [6.3] Panel (substrate): Method A uses a stainless steel panel as the substrate; we tested tapes on various common construction materials: A-C plywood (C side) and OSB (both rough and smooth side). 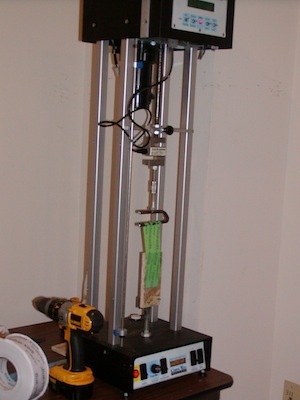 [6.5] Adhesion tester – VanTem Panels’ tester is a constant rate extension (CRE) machine, but D3330 specifies the test rate at 12 inches per minute and the top speed of the Van Tem Com-Ten DFM5000 is just over 1 inch per minute, not a particularly good combination with our “high stretch” construction tapes. More on this above. [9.1] Width of specimens – Most construction tapes are 2 3/8-inches wide (60 mm); we decided to make ALL of our specimens this width. [11.3] “Aging” of specimen – The standard specifies that the test must occur within 1 minute of adhering the tape to the substrate. 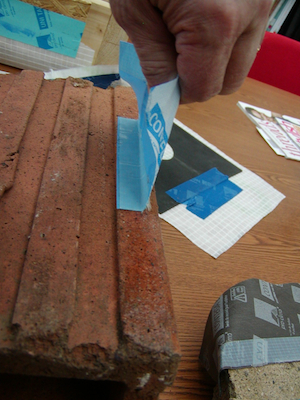 We had quite a bit of variability (up to one week…) in how “old” the adhesive bond was between the tape and substrate. More on this above. Precision and bias – We did mostly single specimen testing, not even close to the number and tolerance for variation called for by the standard. Clearly, our benchtop testing is VERY different than the standard and mainly about looking for some generalizations we might suggest from comparing tape test results. We don’t come anywhere near claiming ASTM D3330 results. What have been your experiences—anecdotal or otherwise—in field service of flashing tapes? Please comment below. Your spreadsheet would be more useful if it had a column for the type of each tape, and more useful yet if it had a column for the cost/foot of each tape. But, as you suggest, the issue is not so much initial adhesion under ideal conditions, but long-term adhesion and material coherance under real-world conditions. The bottom line for me, as Dr. Joe Lstiburek often reminds us, is that physics trumps chemistry. Relying on tapes and adhesives for a weather barrier (rather than laps and gravity) is foolish, and attempting to make a house envelope hermetically-sealed is both unwise and unnecessary. The important question is "How tight is tight enough" and building scientist and moisture expert John Straube answers that 2-3 ACH50 is the optimal level of building performance.